This is the Best Method to Fix this Error.You just need to Shut Down your Computer and Unplug Your Computer from the Power Supply for about 5-10 minutes.How to Password Protect Your USB Flash Drive : USB Secure Sometimes it is necessary to reboot the Motherboard so that the Microprocessor can reload all the Computer Drivers and thus Making the USB Ports to Recognize Your Devices.Just Turning Off the Computer Doesn’t help you as the Motherboard is still getting the Power therefore it is necessary to Unplug the Computer From the Power Supply.Now a days Modern Computer Power Supplies are Provided with a Switch at the Back Side to Turn off the Power Supply Manually.How to Increase Mozilla Firefox Browsing Speed ? Now Expand Disk Drives and Select Your USB Device. 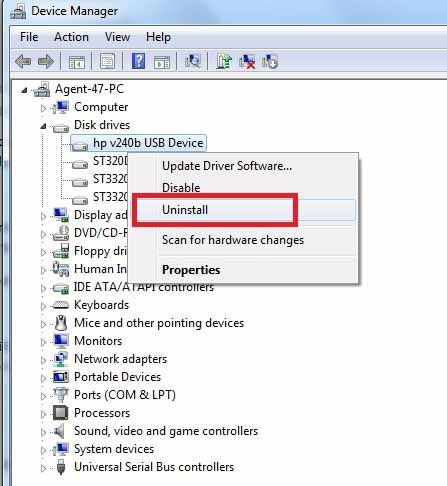 Right Click on Your USB Device and Select Uninstall as shown below in the Image. .
After Uninstalling Unplug Your USB Device. 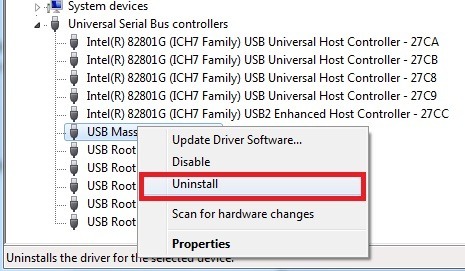 If all the above two method fails then try this method.You need to Uninstall USB Controllers one by One so that after you restart your Computer they will be automatically reinstalled. Open Device Manager by Going to Computer Properties. Next Right Click on any Device and Select Uninstall as shown below in the Image. Restart Your Computer and they will be Automatically Reinstalled.